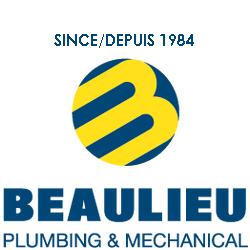 Beaulieu Plumbing and Mechanical Inc. (BPM) was founded in 1984 by Mr. Gaetan and Mrs. Carol Beaulieu in a small room at their family residence in Caron-Brook, NB. Owing to the founders’ vision and perseverance, our company grew and acquired land and a building on Victoria Street in Edmundston. More office space was needed to accommodate its growing workforce and to sustain its growth. At first, BPM’s activities were limited to the Edmundston and Grand Falls region; they now extend across the province and, occasionally, to Nova Scotia and Prince Edward Island. BPM expanded from 4 employees in 1984 to more than 90 in 2008. Initially providing only plumbing services, our company has grown to encompass, among other services: Plumbing, Heating, Geothermal, Ventilation Manufacturing and Installation, Refrigeration and Medical Gas. For 31 years now, the range of our operations has led us to draw on the expertise of nearly 100 collaborators. After all those years of involvement in large scale commercial projects such as schools and hospitals, we proudly realize that our organization has earned itself an enviable reputation in the marketplace and provides quality services capable of meeting the needs of its present and future clients.